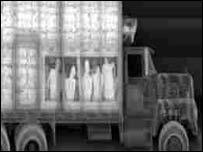 BBC NEWS | UK | Magazine | Could X-ray scanners work on the street? X-ray cameras that would "undress" passers-by in a bid to thwart terrorists concealing weapons, could be coming to a street near you, according to reports. Aside from the obvious privacy issues, would such a plan work? Leaked documents said to have been drawn up by the Home Office and seen by the Sun newspaper say cameras which can see through clothes could be built into lamp posts to "trap terror suspects". While Home Secretary John Reid has denied knowledge of the plans, the technology is not dissimilar to that already found in some UK airports. Currently, air security officials pick out individuals to stand in a booth while three pictures are taken of the person in slightly different positions. Within seconds, an X-ray scanner produces an image of the body, minus the clothes. What shows up is the naked human form and anything that may be concealed on the person, such as coins, a gun or drugs. There are other variations on the X-ray technology. Millimetre wave machines give more of a three-dimensional image, while terahertz radiation also penetrates clothing. A one-month trial at London's Paddington rail station involved a millimetre wave scanner. A portable version - an "electronic wand" - was trialled last year at London's Canary Wharf and Greenford Underground stations. No decision has been made about wider implementation, according to a Department of Transport spokesman, who says the challenges are being evaluated. But security expert Bob Ayers, of Chatham House, believes putting an X-ray lens on a lamppost poses all sorts of resource questions. "Some guy walks past and his picture is beamed back to a control room to say that something is under his jacket. What do you do? Despatch a police car to hunt him down and frisk him? "The real question is not whether the technology can see something under the clothing. It's how you respond to it when the technology says there's something unusual. "Do you have police strolling down each street, ready to ask people what they have under their jacket?" The manpower cost would be "astronomical", he says, and CCTV would be required to match a description to the suspicious image. "If you don't pick them up in minute or two, he's gone. What good does it do for you to know that at 11am this morning a guy walked down Victoria Street with a gun in his jacket?" Besides, there could be problems distinguishing a money bag from a bomb strapped at the waist. But privacy should not be a concern because there is only a shadowy outline of the body, says Mr Ayers. Professor Paul Wilkinson, a terrorism expert, is also doubtful. There would be a huge installation and maintenance cost, he says, plus the risk of antagonising ordinary citizens. "The practicalities of these things working, if sufficient light, is in no doubt. The questions are when is this a useful addition to security and when does it become unduly intrusive and worrying to the public?" What works for airline security, where passengers expect thorough checks, would not necessarily be tolerated when walking down the street, he adds. Mr Ayers believes the best use of this technology is in a captured space, like at airport security or in a bus depot. A spokesman for Qinetiq, one of the first firms to develop millimetre wave machines, says there have been successful uses for them. "The Immigration Service has about eight or nine deployed around Europe, to see lorries crossing the Channel or at sea crossings into the UK. "Using this technology alongside complementary technology such as CO2 monitors, they have detected thousands of people stashed away on lorries." He adds that the US military are trialling millimetre wave machines at military checkpoints to combat the threat of suicide bombers. The use of cables mean they can be operated from any distance. Given the abuse of CCTV images, how can one be sure that scans will not be misused? At minimum there has to be clear notification whenever such a scanner is in use: scanning without consent is an invasion of privacy. No doubt there will be people who will claim this is an invasion of civil liberties, I wonder how they would feel the same way if their plane was hi-jacked? This is an excellent product and as a member of the British army would like to see it put in its proper place: Out on the front line with the soldiers that are on the ground. As for the privacy issue, if you have nothing to hide what is the problem? You can't go around pointing x-rays at everyone all the time. The whole country will get cancer. The Orwellian grip tightens a little further! As a boy I remember every shoe shop had free X-ray machines to show your feet in your selected shoes. These were withdrawn when medical science belatedly became aware of the dangers of receiving to many X-rays. I went through one of these scanners at the airport when they were trialling them at Heathrow. I obviously didn't know what it was and had nothing to hide so I agreed. Tempted by the fast track they promised through security. They asked me if I wanted to see the image afterwards, which I agreed as I was intrigued. What I saw horrified me, it was literally a stripped bare me on the screen! I'm all for safety and measures against tourism but regularly being "strip searched" in effect walking down the street is another thing. I carry a multitude of tools on my person to do my job. I'd have the police out every few seconds. I'll have to get myself some lead lined long johns. Well, as I've been campaigning for years for more naturist beaches, and for naturist areas in inland parks, having security cameras that can see us naked through our clothes must remove the last vestige of arguments against public naturism! Why not just microchip us all at birth, and post sniffer dogs and x-ray machines outside everyone's front door?